Uygur means union or alliance. The Uighurs had their abode in the seventh century in the north-west of Mongolia; and in the eighth century they dwelt near the place where, in the five hundred years later, the Mongols built Karakorum. In the ninth century their empire in Mongolia was destroyed by the Kirghiz, when they were dispersed, and apparently split into two parties. The eastern branch came into contact with Chingiz Khan. After and thenceforward they appear in the Mongol-Chinese annals as under the name of Weiwu-rh. Of the Western Uighurs little is known, but they may be identified with the Eastern Turks of Mohammedan authors of the eleventh and twelfth centuries. Modern Uygur people can trace their ancestors back to the nomadic tribes who lived in the area of Lake Baikal and the Irtish River further north of today's Mongolia about 200 BC, contemporaneously with the Han Dynasty of the Middle Kingdom. The various Turkish tribes found on the eastern slopes of the Tian Shan, in Kashgar, Yarkand, Khotan, &c., are the descendants of the ancient Uighurs or Ouighours. These people were probably the most eastern branch of the Turks who remained behind when the first westward movements were made, but subsequently moved westward themselves. According to the Mohammedan historian Juvaynl, the Uighurs originally came from the valley of the Orkon River. BC 700 is given as a conjectural date of the first migration of the Turks across the Oxus-as far as India and Asia Minor. The name Uighur is first found in Mohammedan histories at the beginning of the thirteenth century. Previously to this they seem to have been known by the name of Taghazghaz, which is doubtless a corruption. The Hui-ho of the Chinese authors anterior to the Mongol period are identical with the Uighurs, and the Uighurs are to be classed among the Eastern Turks. The term Hui-ho was, however, used by Chinese writers of the Mongol period to designate Mohammedans generally. The first king whose name has come down was Buku Khan, whom tradition has identified with the great Afrasiyab. Afrasiyab is one of the most prominent figures in Firdawsi's great epic of kings, the Shah Nami. Tradition has it that Afrasiyab flourished about B.C. 580. He was the emperor of Turan, of which Turkestan was a province, and was the great foe of Iran. Buku Khan, having learnt in a dream that he would possess the entire world, assembled his troops and sent his brothers to wage war against the Mongols, Kirghiz, Tanguts, and Khitays. They returned to their dwelling place with great booty, and founded the city of Urdu Balik. Buku Khan again dreamt that a piece of jade was given him with the assurance that as long as he preserved it he would rule the world. The prospect induced him to turn his arms to the west and enter Turkestan, where he built the city of Balasaghun. 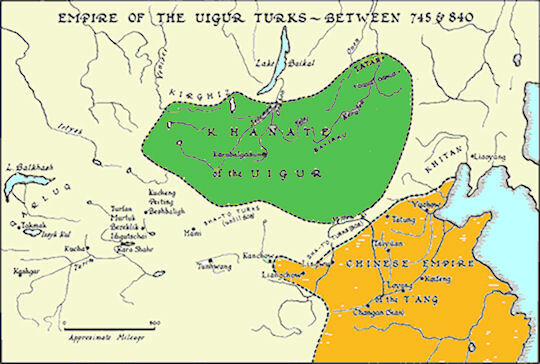 The Uighurs fiist appear in histories in the 6th century, when they were known as the Kao-ku or High Carts, one of the two main divisions of the Turks in and around Northern Mongolia. In AD 744, the Uighur founded a khanate in Mobei, an area encompassing Lake Baikal and Mongolia. They even dispatched troops twice to help the Tang central authorities to quell rebellions. Their period of independent greatness was from 750-850 AD, corresponding with the height of the glory of the famous T'ang Dynasty. The Uighurs attained a very high level of culture, and archaeological research has brought to light a vast amount of Uighur literature and art from which we learn that Christianity, Buddhism and Manichteism were all practised in their kingdom, the utmost tolerance being observed while Manichseism was the state religion. The Uighur Khanate collapsed in 840 because of natural disasters, internal strife and attacks by neighboring tribes. When the Uighur empire at Karakorum was broken up a large portion of the race went southwards and settled on the Chinese frontier. On the downfall of the Uyghur rule Kashghar became the capital of the Cara Khitay king, Gorkhan, and passed from him to Koshluk prince of the Nayman Kirghiz- at that time with the Cara Khitay mostly Nestorian Christians - till a few years later it was seized by the Mughals headed by Changiz. Under the Mughal rule the city flourished, and recovered its importance as a commercial centre on the restoration of the trade with China; but, during the years of anarchy succeeding the death of Chaghtay, it appears to have lost much of its importance till the restoration of the Chaghtay family, in the person of Toghluc Tymur, again raised it to pre-eminence in the country. But only for a short time, for in the reign of his son Khizr it felt the full force of Tymur's last campaign in this direction, and was reduced to a state of poverty and depopulation from which it never recovered thoroughly. Finally it was utterly destroyed and effaced from the earth by Mirza Ababakar. When Ogotai Khan began to build his capital at Karakorum, it was said to be among the ruins of an old city. Among them a pillar was found with an inscription upon it declaring that on that site Buku Khan, the chief of the Uighurs, had, in the 8th century, built his palace, and that it had been the residence of his successors. Karakorum was, in fact, the capital of the old Uighur Empire. This empire was overturned in the 9th century by an invasion of the Hakas, who had lately become very powerful. The account may be read in detail in the annals of the Thang dynasty, published among the Jesuits' Memoirs on China. The Uighurs were driven away, and migrated to the south-west, to the country of Bishbalig, while the invaders took possession of their land. At this time the Chinese accounts cease for a while to give us any light on their northern neighbors. Karakorum (Turkish, "black stone debris") is the name of two cities in Mongolia. One of these, according to G. Fotanin, was the capital of the Uighur kingdom in the 8th century, and the other was in the 13th century a capital of the steppe monarchy of Mongolia. The same name seems also to have been applied to the Khangai range at the headwaters of the Orkhon. (1) The Uighur Karakorum, also named Mubalik (" bad town "), was situated on the left bank of the Orkhon, in the Talal-khain-dala steppe, to the south-east of Ughci-nor. It was deserted after the fall of the Uighur kingdom, and in the 10th century Abaki, the founder of the Khitan kingdom, planted on its ruins a stone bearing a description of his victories. (2) The Mongolian Karakorum was founded at the birth of the Mongolian monarchy established by Jenghiz Khan. A palace for the khan was built in it by Chinese architects in 1234. Piano Carpini visited it in 1246, Rubruquis in t2S3, and Marco Polo in 1275. Later, the fourth Mongolian king, Kublai, left Karakorum, in order to reside at Kai-pin-fu, near Peking. When the khan Arik-bog declared himself and Karakorum independent of Kublai-Khan, the latter besieged Karakorum, took it by famine, and probably laid it waste so thoroughly that the town was afterwards forgotten. The exact sites of the two Mongolian capitals were only established in 1889. Sir H. Yule (The Book of Marco Polo, 1871) was the first to distinguish two cities of this name. The Russian traveller Paderin in 1871 visited the Uighur capital, named now by the Mongols Kara Balghasun (" black city ") or Khara-kherem (" black wall "), of which only the wall and a tower are in existence, while the streets and ruins outside the wall are seen at a distance of r| m. Paderin's belief that this was the old Mongol capital has been shown to be incorrect. As to the Mongolian Karakorum, it is identified by several authorities with a site on which towards the close of the 16th century the Buddhist monastery of Erdeni Tsu was built. This monastery lies about 2s m. south by east of the Uighur capital. North and north-east of the monastery are ruins of ancient buildings. Professor D. Pozdneev, who visited Erdeni Tsu for a second lime in 1802, stated that the earthen wall surrounding the monastery might well be part of the wall of the old city. The proper position of the two Karakorums was determined by the expedition of N..Yadrintsev in 1889, and the two expeditions of the Helsingfors Ugro-Finnish society (1890) and the Russian academy of science, under Dr W. Radlov (1891). The Uighurs were certainly the most civilized of all the northern neighbours of China, and though their kingdom was destroyed in 850 by a northern Turkish tribe, the Khirgiz, the Uighurs by no means disappear from history, and up to the 15th century there were constantly small Uighur principalities and states springing up, while during the whole of this period the Uighurs were extensively employed in Muhammadan chancelleries, playing much the same role in the governthe Tartar people of the Tarim basin) were not so much conquered as induced to join his organization. He then attacked the Kin empire and took Pekin (1214). The Khitan people, who had been so recently subdued by the Kin, threw in their fortunes with his, and were of very great help to him. The settled Chinese population went on sowing and reaping and trading during this change of masters without lending jts weight to either side.